Here are some of tips and tricks for time attendance system. Apart for these quick trips, you can find user manuals and FAQs as well for you quick learning. How to transfer leave balance? Go to Reports/Leave Summary Report. Select Year and leave type (Choose only one leave. Transfer button will appear if only one leave is chosen.). Click on transfer icon (Transfer button will be visible only if preceding attendance year is set.). 5. On pop up, click 'Transfer Leave Balance'. 6. Go to Posting/Opening Leave. 7. View the transferred leave. 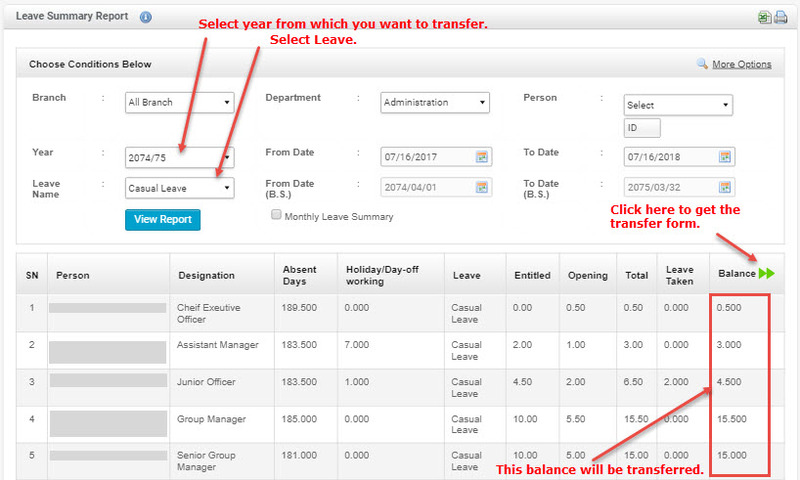 Note: If you re-transfer again, the transferred leave balance will be updated. How to create a user in the attendance software? The option is available in 'Personal Details'. You need to click 'Add New Person'. Once you save, the user receives an automatic email with login procedure for attendance system. These users can view their attendance and leave records. What if user forgets his/her login password for attendance software? Either, you can reset the password from the option 'Forgot Password' available on login panel or you can request Admin to change the password to reset the new one. The admin can reset it from the option available in Users Setup. How to make Administrators for attendance system? When your online attendance system is set, we send you an administrator account. Further this admin can make multiple admin too. The option to change a user to an admin is available in Users of Setup menu. In Personal Details, email address is compulsorily required, but all the employees do not have email address. What can be done for this? What need to be done to create Department Head or Branch Manager Login? Department Head or Branch Manager is benefited with separate login authorized to view all the reports of his/her concerned department or branch only. For this login, the admin needs to give rights to concerned person from Users of Setup menu. Then, the system automatically defines the rights of concerned person. Also, the admin can define more permissions. Can Department Head/Branch Manager be an Admin too? Department Head/Branch Manager login and Admin login are separate logins. The difference is that admin manages the whole system whereas Department Head/Branch Manager can just view all the report of his concerned department or Branch only. If a single ID is assigned with both, admin login would be better. For all the reports, there is an option to choose the department and branch which facilitate to view the required report only. How can I authorize a person for approving or recommending leave and other applications? You will find the list of users with check box for Approve or Recommend in Authorized Persons option available in Setup. Just check the box for the one who is authorized according to Company policy. Then, their name will be displayed in drop down accordingly in the leave and other applications of users and posting of admin. How to delete leave which has been applied or posted by mistake? Until the leave is approved, the employee can also delete the leave from Leave Application menu. Once it is approved, only admin is authorized to edit or delete the leave which has been posted by mistake. The option to add, edit or delete is available in Leave posting. How to delete personal details of employee who has resigned? For the users whose attendance has already been recorded in software, you cannot delete the user. The system would not allow deleting that user. You can just change the status of that user from 'working' to 'not working' status. You can do it from edit option available in Personal Details. Once you change the status, that user will be hidden from all of the reports like Personal Attendance Report, Daily Attendance Report and Monthly Attendance Report and so on. This is advantageous as it let you to keep the personal record of employee which might be useful in future for look on past reports. Like in personal detail, that user displays in Users also (Setup > Users). For the users whose even single attendance has not been recorded in software, you can delete that user directly. Such deleted user will not be displayed in any of the reports. Though the attendance is done, the software shows absent. What can be the reason? There system works in a process. Once the employee shows card or punch finger in device, the attendance goes to local database server. Then, local database server sends attendance logs to web server by internet. In this way, the attendance is seen in software. This process generally takes 10 minutes to import the data from device to software. So, the user might be confused with the absent report though they had done attendance in device. What can be the problem when leave is not being allowed to apply? The admin must maintain Entitled Leave and Opening Leave (Posting > Entitled leave, Opening leave) for all of the employees. Otherwise, the system won’t allow applying leave if you have set to check leave balance when applying leave. Similarly, if the employee has no leave balance, the system won’t again let to apply leave. The one who is applying for the leave must be sure for the entitled leave or remaining leave that can be applied. The employees can can know his/her leave balance from Leave Record. Can the date of approved leave be changed? What to do with ‘No More Space’ message in device? Generally, this message come when the device transaction memory is full. In this case, you need to clear the log of attendance. Before deleting the att log in device, you must be sure whether the complete data has been imported to the software or not. Once you are confirmed, then, you can delete the attendance log. I got message, 'Something went wrong!' in our attendance system. What should I do? This happens when some error has come in the system or during our updates. If it is not corrected automatically within sometime, please contact our support team. I have edited the attendance date & time but it shows in attendance report. Is it possible to hide from reports? No it is not possible to hide from the reports. The system tracks who has edited the record and shows that in reports.